​Losing control by growing too rapidly or beyond their experience. Not being able to source cost effective growth capital. Not being comfortable executing more aggressive sales & marketing. The never ending challenge of finding great people to hire. All good reasons to explain what has happened. Until now. WarrenBDC works as a strategic partner, to help Owners overcome the roadblocks, reveal and realize the hidden and obvious potential that exists within every business and grow the company to where the Owner knows it could be. When the company and the Owner are ready we, as consultants, can introduce potential Buyers. Together we consult on the sale/transition of the Owners' business. Ideally for more than it is valued at today. Our expertise is available to clients who work with us through the exclusive WarrenBDC Process. The process has been developed to systematically prepare your business for sale on your terms. 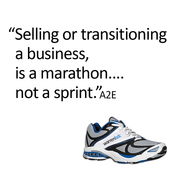 Go from 'I want to sell to SOLD'. Want an Exit Strategy? Click here. At WarrenBDC we enjoy working with owners of Small and Medium-sized Businesses with annual sales of $2,000,000 to $25,000,000. Exceptions for larger or smaller businesses will be considered on an individual basis. We provide established Small and Medium-sized Businesses with all the strategically sound, quality, integrated Operations, Finance, Sales & Marketing, HR and Growth Funding expertise needed to plan and implement a successful exit. Family run businesses can have their own unique challenges. We have years of experience and a breadth of skill sets capable of quickly identifying and overcoming these common road blocks. We think we've seen it all. But you never know. Bring us your unique challenge and let's find out. Your family challenges may not be as unique as you think. [ ] Annual sales of $2,000,000 - 25,000,000. [ ] A burning desire to exit or be well on the way by 2021. [ ] Requirement for an end to end process to sell your business. [ ] The need for real choices about how you exit your business. So finding one outside resource who can identify an acquisition, provide the due diligence and facilitate the purchase would be great. Not so easy to do. In fact our clients tell us it has been very difficult to find anyone like us. We'd like to be your outside resource to help with any and all of your pre and post purchase service requirements.